“There is no doubt, ETIM-UK is a massive undertaking but will provide rewards in the future”. For over 30 years, Venture Lighting has built a reputation as market leaders across Europe in metal halide lighting technology and today with LED products. Venture receive regular requests for their product data in multiple formats from UK wholesalers. Meeting these requests and keeping track of which wholesaler is using which data version is time consuming. In addition, Venture’s customers in Germany require data to be delivered using the ETIM Classification model. Venture knew that they needed to improve and streamline their technical product data, but where to start? 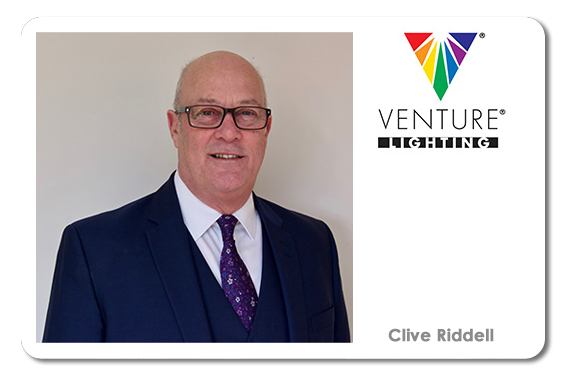 In this case study Clive Riddell, Technical Manager and ETIM Coordinator at Venture, explains how the EDA supported Venture in their journey from a collection of Word and Excel documents, towards a 'slick' ETIM-optimised PIM system, and the role ProPlanet played in it. 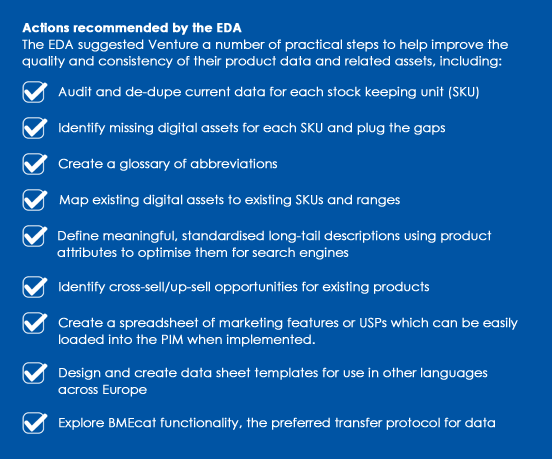 Venture first heard about ETIM-UK at an EDA introductory presentation in May 2017 and eagerly accepted the offer of a free EDA data audit by the EDA’s ETIM-UK Project Manager, David Bate. In July 2017, the data audit took place to run through Venture’s ETIM-readiness and identify practical steps and make recommendations. Venture has a Sage ERP system, but all their attributed product data (none of which was optimised for ETIM) was held on a collection of Word documents and Excel spreadsheets maintained by a part-time, two-person team. Venture’s digital assets (including product images, application images, and logos) were held on separate servers but with no corresponding meta-data or copyright tags, and the dynamically produced datasheets had no protection enabled. Venture’s starting point was to create a Data Strategy and Process Document which is linked to their Product Life-Cycle Process Plan. To help implement this, David Bate’s (EDA) main recommendation was for Venture to invest in a Product Information Management (PIM) system which was configured to store the ETIM classification, ideally version 7.0. A PIM would end Venture’s reliance on spreadsheets and instead provide a centrally maintained single source of classified product data for printed catalogues, multiple language datasheets and multiple web sites. A PIM system configured in this way enables Venture to meet all future data requirements for trading in UK and across Europe, as the ETIM Classification automatically translates into 17 languages thanks to its logical unique coding structure. Additionally, data can be served-up into all print media and online channels without any time-consuming work-arounds. “We chose ProPlanet primarily because of the recommendation from ETIM-UK and its cost-effective price, but also because the system was easy to use. We were also impressed by the professional, friendly support and advice offered by ProPlanet during the implementation phase. Admittedly, there were some initial “teething” issues regarding data compatibility, particularly with our agent in Germany, this was due to versioning issues but with ProPlanet’s assistance this has been resolved". “I’m involved in the creation of the ETIM standard for the UK for the Lighting Control, Luminaires and Emergency Lighting products. Within the ETIM-UK Standardisation Working Groups, which the EDA is leading, I found the open forum discussions very helpful. Having other manufacturers around the table gives us a good insight into how they use ETIM and what benefits and problems they may experience going forwards. Classifying and processing our products into the ETIM structure is very time consuming, but we are committed to proceed. Every new product is automatically 'ETIMised' but we have to go back and do the same for all our products. There is no doubt, it's a massive yndertaking but it will deliver rewards in the future".